The GS1 Databar is a family of barcodes based on the ISO/IEC 24724:2006 specifications to be used with the UCC/EAN system. The barcode is intended for encoding the identification numbers of items and their supplementary data. It is more compact and can carry more information than the current EAN/UPC barcode and is thus capable of identifying small items more easily. As the EAN/UCC system is defined in a consistent manner around the world, it is extremely useful for the identification of trade items. There is a GS1 mandate for all trade-item scanning systems to achieve the capability to read GS1 DataBar bar codes and GS1 Application Identifier System by January 1, 2010. This is also known as the GS1 global sunrise date. GS1 Databar 14 (formerly Reduced Space Symbology RSS14) - Encodes the 14 digits EAN/UCC item identification. GS1 Databar 14 Truncated (formerly RSS14 Truncated) - Encodes the 14 digits EAN/UCC item identification. The height is always at 13X, where X is the width of the thinnest bar. GS1 Databar Limited (formerly RSS Limited) - Encodes the 14 digits EAN/UCC item identification for small items. This barcode is typically not used at retail point-of-sale. GS1 Databar Expanded (formerly RSS Expanded) - Encodes UCC/EAN item identification and supplementary application identifiers (AI) elements such as date and weight. GS1 Databar 14 Stacked ( formerly RSS14 Stacked) - This is a Truncated two row format designed to be used by small items whose available space is too narrow for GS1 Databar 14 Limited. GS1 Databar 14 Stacked Omnidirectional (formerly RSS14 Stacked Omnidirectional) - This is a full height GS1 Databar 14 two-row format. It is used for omnidirectional scanning applications where the different aspect ratio is needed. GS1 Databar Expanded Stacked (formerly RSS14 Expanded Stacked) - This is a two to eleven rows format of GS1 Databar Expanded. It may be used when there is not enough space to accommodate the full single row expanded format. ConnectCode GS1 Databar barcode supports up to seven different heights. These barcodes are provided in a set of seven fonts with different names. 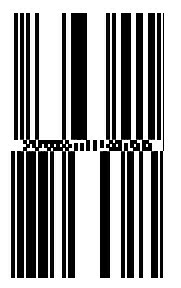 The barcode names are appended with characters like "S1" or "S2" etc., with each one of them representing a different height. The list below illustrates the fonts supported. The following fonts are used for GS1 Databar 14, GS1 Databar Limited and GS1 Databar Expanded. All characters supported by the barcode are as shown below. 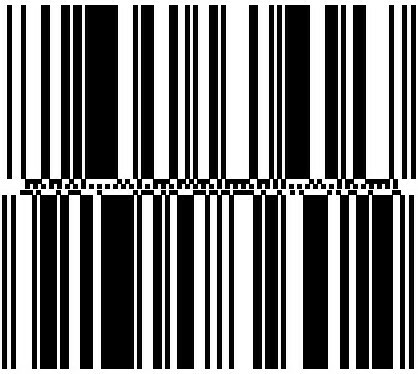 The data characters do not have a direct mapping as in other simple barcodes. This means you cannot type a string "12345" into a text editor and then simply change its font name to CCodeGS1D_S3 and expect it to scan. You will first need generate the barcodes using the Encoder or VBA Macros provided in the ConnectCode Font Package, before pasting them into the text editor (or other third party softwares). For example, to encode the data "(01)00012345678905", you can key in the following into the Encoder. The (01) is not required as it is already assumed in GS1 Databar 14. For example, to encode the data "(01)00012345678905", you can key in the following into the Encoder. The (01) is not required as it is already assumed in GS1 Databar Truncated. For example, to encode the data "(01)15012345678907", you can key in the following into the Encoder. The (01) is not required as it is already assumed in GS1 Databar Limited. For example, to encode the data "(01)00012345678908(10)ABC123", you can key in the following into the Encoder. For example, to encode the data "(01)90012345678908(3103)001750", you can key in the following into the Encoder. For example, to encode the data "(01)00012345678905", you can key in the following into the Encoder. For example, to encode the data "(01)00034567890125", you can key in the following into the Encoder. For example, to encode the data "(01)98898765432106(3202)012345(15)991231", you can key in the following into the Encoder. You may see spaces between multiple Rows when you use the GS1DatabarExpandedStacked barcode in Microsoft Excel. The spaces can be easily removed by copying the resulting output, or barcode, into Microsoft Word (or Wordpad) before printing them. Export of the GS1DatabarExpandedStacked barcode as an image ( jpg / png / tiff / bmp ) is not supported in the Encoder. The Crystal Report Formula for the GS1DatabarExpandedStacked barcode is not included in this Trial. Please contact us at support@barcoderesource.com if you require it. The recommended starting font size for this Stacked Font is 48, however, you may reduce it as necessary and test the scanning with your barcode scanners. In our lab tests, the font size can go as low as size 18 and still work for our scanners. The font has been specifically optimized for printing. When it is set to a very small size, it might appear 'fuzzy' on screen but will print beautifully on the printers.